Meridian is a city located in Ada County in the state of Idaho. It is the 3rd-largest city in the state of Idaho. Blue Cross of Idaho, Idaho State Police, and the state police academy are all located within the city limits. Scentsy, a candle warmer company, is a large employer with corporate headquarters based here also. Roaring Springs is a large water park near the Meridian I-84 exit. Wahooz is a large family entertainment complex open year-round featuring go carts, bumper boats, miniature golf, batting cages, laser tag, bowling, an arcade and grill. The Village at Meridian is an outdoor shopping mall that opened in October of 2013. It is home to retail stores, restaurants, a movie theater, a fitness center, arcade/bowling, and an outdoor ice rink (winter). There is outdoor seating and a playground surrounding a fountain that has a show every hour with lights and music. 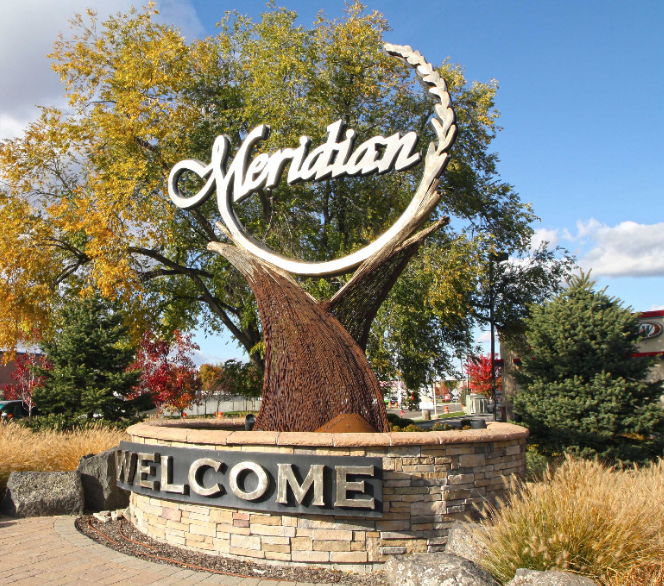 The city’s Parks and Rec department manages 17 public parks throughout the city including Meridian Settlers Regional Park which hosts free outdoor movies during the summer months. The Meridian Speedway lies within city limits directly south of Old Town. During the summer months of May through September, the place to be on Thursday evenings is the Meridian Urban Market, also known as MUM by locals. This open-air Downtown urban market provides a neighborhood farmer’s market, artisan market, food-tasting, local art, live music and a beer and wine garden.